Construction work has begun on a dozen bridges across Kentucky as part of the Bridging Kentucky program. This bridge is located in Scott County. FRANKFORT, Ky. (October 2 2018) – A quick-start approach pioneered by the Kentucky Transportation Cabinet this summer has resulted in an unprecedented six-year program to restore more than 1,000 critical bridges across Kentucky. 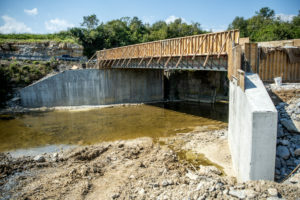 Work is starting on about two dozen bridges, and the Bridging Kentucky program is laying the groundwork for 2019 to be one of the busiest bridge-building years in the state’s history. Since the program was launched in June, teams have evaluated more than 1,100 bridges. Bridges are prioritized based on need and cost-effective solutions. Twelve bridges have entered the construction phase – with rehab and replacement work under way or about to start. This fall, more than a dozen additional bridges will go to construction. Bridging Kentucky is one of the nation’s most aggressive bridge rehabilitation and replacement programs. It represents an unprecedented commitment by the state to prioritize investments to improve the safety and soundness of bridges throughout Kentucky. The estimated investment of approximately $700 million over six years is the result of a data-driven, priority-setting approach led by Gov. Matt Bevin and backed by the 2018 Kentucky General Assembly. This list of critical structures includes state, county and municipal bridges that have fallen into disrepair and are rated in poor condition. More than 60 of those bridges currently are closed to traffic. A dozen Bridging Kentucky projects already have moved to the construction phase for bridge improvements in Garrard, Jefferson, Johnson, Kenton, Laurel, Madison, Metcalfe, Pike, Scott and Union counties, and the first of these projects will be completed this fall. In the coming months, additional bridge projects will move to construction in Breathitt, Casey, Hardin, Harlan, Jefferson, Kenton, Knott, Madison, Mason, Metcalfe, Muhlenberg and Washington counties. Meanwhile, site assessments are beginning this week and will continue at hundreds of bridges throughout Kentucky over the next few months. During these onsite evaluations, design engineers, environmental experts and surveyors will collect information needed for bridge design and construction. This work will not cause significant disruptions to traffic, but drivers should use caution when they see signage near a bridge where workers are onsite. With hundreds of site evaluations starting this fall, KYTC will be prepared to move forward with a wave of construction activity next year. The state’s plan is to start or complete construction on more than 300 bridges in the first two years of the program – focusing first on bridges identified as priorities by the Kentucky General Assembly in the approved biennium transportation budget. Bridging Kentucky has launched a website and social media channels to share additional information about the program and evaluation process. The site, BridgingKentucky.com, provides an overview of the program, a list of frequently asked questions and an initial list of bridges that will be addressed in the first two years. Additional structures will be added to this list as the bridge evaluation process continues, and additional information will be shared as the new program advances.